Not sure what this tree is called, but spring brings beautiful flowers to the neighborhood where my mom is living. The branches droop down, heavy with pink flowers and sways in the wind. It doesn't matter what else is going on in the world; trees and flowers still show their glorious awakening after a long sleep of winter. Sure is pretty whatever it is! These are gorgeous, Icy and I love the mosaic you created. Vivid colours!! Boom & Gary of the Vermilon River, Canada. 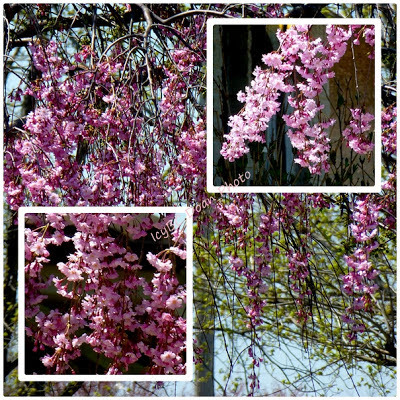 There is nothing as beautiful as trees covered in spring blossom. Not sure of the id, but the blossoms are beautiful. Lovely photos and mosaic. Have a happy week! Beautiful--I am not sure what it is called either! Wonderful weeping cherries. I have them at my front door. wow, those are so beautiful blossoms. What a beautiful tree! Does the blossom last long? this tree is beautiful - just the way I like a tree to look.